Bye Ikea pan! Welcome Calphalon Fryer! Cooking has been my passion for a long time. I like to try different recipes and cook for my family. To make everything perfect and get the recipe right, I need to have quality cookware (I know it does not sound convincing, but I just need an excuse to shop and try different cookware!). I used to use IKEA frying pan. At the first two months, I was in love with it. It went well with the decoration of our kitchen and other cookware. On top of it, it was very easy to clean and it does not stick. The price was very reasonable, especially compared with other major brands. What made me change my mind? After several months, I started to notice that some residual got stick to the pan and very hard to remove it. I usually clean my cookware right after my cooking and do not wait til the end of the day. The pan warped and got greasy. I tried different ways to clean it, but no luck. I did not do anything about my IKEA frying pan and I thought that I did not take care of my pan properly. 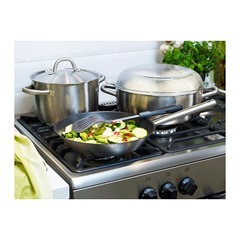 I received Calphalon Nonstick 5-Quart Saute Pan from my friend Joanne as a Thanksgiving gift. My first impression of Calphalon Pan is: very heavy! I did not use Calphalon Nonstick 5-Quart Saute Pan immediately because the weight makes it difficult for me to move it around. I started to use it after a week, and til the time I am writing this article, I have been using it for almost three months and Calphalon Nonstick 5-Quart Saute Pan still looks like a brand new one. I am very pleased and impressed by the quality of Calphalon Pan. However, it is not fair to compare IKEA frying pan with Calphalon Nonstick 5-Quart Saute Pan as their price are very different. Calphalon Nonstick 5-Quart Saute Pan costs about $80 and IKEA frying pan only costs about 20 bucks. I have to confess that I do not normally use this type of pricy cookware because I know that they do not last. I was fortunate to receive Calphalon Nonstick 5-Quart Saute Pan as a gift, otherwise I won’t know YOU GET WHAT YOU PAY FOR!! At least from my near three months experience, it does not warp and very easy to clean. Thank you Joanne for this wonderful gift! !